Given the weakness we have seen in energy commodities over the last several weeks, we also noted on each chart where oil made its double top in August. This should help investors gauge which sectors have benefited (Consumer Discretionary and Technology) and which have been hurt the most (Energy, Utilities, Materials, and Consumer Staples) from the fall in oil. If oil continues to decline, these sectors should continue to benefit and if it reverses higher, expect the opposite to occur. We just sold our very last Birnyi Stock Selection Dartboard of our current stock, meaning that our entire inventory was purchased in three days! Because of the degree of demand for the boards, we are scrambling to get more in stock and are therefore pleased to announce that we are still accepting orders! Be advised, shipping is now expected to take 4 to 6 weeks while we wait for the new batch of boards to get in, but that is still ample time before the onset of the holiday season. Orders can be made below. Shipping is still free anywhere in the U.S.! With RIMM trading up nearly 20% in the pre-market, we looked at prior times that the stock gapped up at least 10%. Of the 19 times this has occurred, the stock went higher from open to close 12 times. 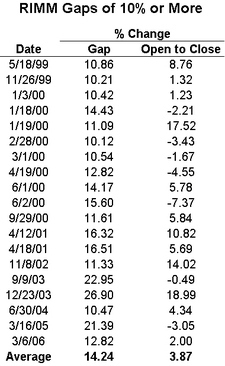 The overall percentage change from open to close on these 19 times is 3.87%. 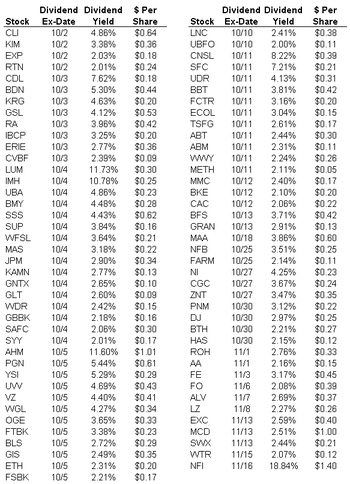 For all of you dividend lovers out there, below is a list of Russell 3000 stocks that have a yield of 2% or more and go ex between now and November 16th. Enjoy. The problem is, the Dow isn't at an all-time high yet (as of 9:50 am). The Dow briefly went above the all-time closing high this morning, but still hasn't reached the intra-day high on January 14, 2000 of 11,750.28. Birinyi Dartboards Almost Sold Out! After just two days, our supply of Birinyi Stock Selection Dartboards has been drastically reduced (a pleasant surprise)! With just a minimal amount left, make sure you get yours while they last. Click the order button below to purchase yours now. 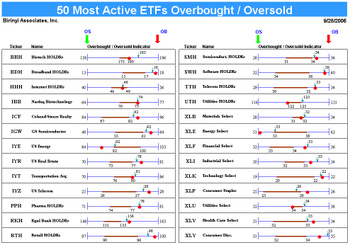 Below is our Overbought/Oversold screen for the US sector ETFs. Please refer to the key for an explanation of how to read the charts. SBL and JNPR are currently trading the furthest above their 50-day moving averages while CNX and NEM are the furthest below. 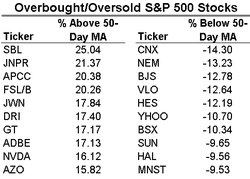 Plenty of energy names are still showing up on the oversold list. 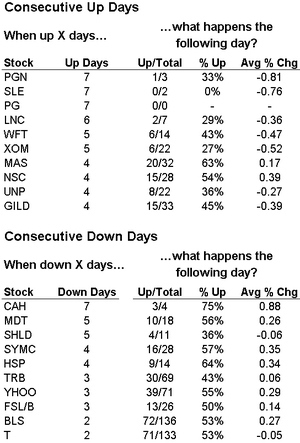 Looking at our list of winning and losing streaks on the S&P 500, PG has been up 7 days in a row along with PGN and SLE. Procter hasn't been up this many days in a row in the past three years. XOM has been up 5 days in a row. The stock has been up 5 days in a row 22 times in the past three years and has been up the next day just 6 of those times. ... Just a small sampling from the Web's top news services. And if you've had the pleasure of being glued to a CNBC feed all day, you've seen the "Breaking News" banner at the bottom of the screen nonstop for about five hours. (Didn't Breaking News used to be a finite event?) This is one of those records that lacks the excitement of, say the Roger Maris single-season home run chase, because it is more a matter of when than if. The overkill of media coverage of the approaching record, however, does serve to postpone its arrival by theoretically prompting sellers to act. But we don't want to rain on the parade too much: celebrate and enjoy the rally!